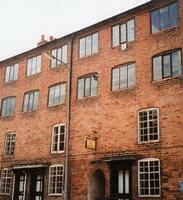 The building that the Textile Museum is situated in is a fine example of a typical early 19th century weaving shop. It consists of two floors of six (now three) back-to-back cottages and two large rooms on the second and third floors running the full length of the building. The six cottages would have housed a family each. Most members of these families would have worked in the weaving shop on the two floors above either as handloom weavers or with associated work. In 1962 the late Major Peter Lewis of Newtown formed a committee to purchase and preserve this building and to create a record of the history of the woollen industry in Newtown. Volunteers worked hard to create a textile museum which was opened to the public in 1967. In 1990 the museum charity was transferred to Powys County Council. Once inside the building the visitor is invited on a journey through the history of the woollen industry in Newtown from the handloom era during the early 19th century, through the stagnation and social unrest of the 1830's and 40's to the regeneration of the industry in the 1850's. The displays include a recreated weaver's cottage and working area from the 1830's. The exhibition finishes with the final decline of the woollen industry in the 20th century.